Today was my second day teaching at school, and I'm feeling pretty good about it! To begin with, the educational system in the Philippines is slightly different than in America. While America begins their public education when the student is five years old and in Kindergarten, the Philippines begins when students are 6 years old and in first grade. Elementary school then continues until 6th grade, leading into high school. The high school grades are labeled as Year 1, Year 2, Year 3, and Year 4. When a student graduates from high school they are usually around 16 years old. So compared to American students, the high school students that I work with are about the same age as seventh and eigth graders. 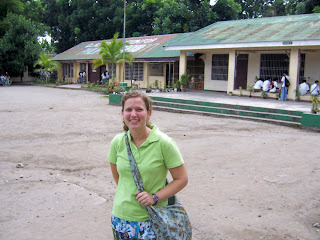 I am co-teaching with a Filipino teacher 3 afternoons a week. I arrive at the school around 1:30 pm and head for the first class. This first classroom is the last classroom on the left end of the picture shown. It's a Year 1 class, the students are on the younger side. There are around 45 students in this class. This is probably my favorite class to teach. They can be talkative, but they always settle down when I ask them to. Today we talked about main idea, supporting details, and transition words. I felt good coming out of this class; like my mission was completed for the day. The day was no where near done however. The second class I go to is a Year 2 class, so they're slightly older. I haven't actually begun to teach this class yet, but I should begin sometime next week. Again, this class had about 50 students in it. The third class is the most challenging of all. It's the last class of the day, one flouresant light bulb for the entire room, and no fans; it's a recipe for a long hour. The kids must be tired by that point, because I know I sure am! It's another Year 1 class, so a repeated lesson from earlier in the day. By the end of the day it's 4:30, and time for a quick lesson planning session with the co-teacher. I usually walk back to the host family's house then, which takes a little over half an hour. Hi Buckwheat! You look like you are in your element! Actually, in Philippine curriculum children start going to school at 4 years old. They go to nursery. At 5, to Kindergarten, and at 6, to Preparatory. Unfortunately, schools in other parts of the country are not prepared yet for early childhood education (lack classroom and teachers with specialization in early childhood education) so the classes start in first grade, as in the case of the school where you teach. In many other provinces, especially in towns near the cities, there are preschool classes.